We are privileged to introduce ourselves as Shreeji Chikki from Ahmedabad, Gujarat-India. 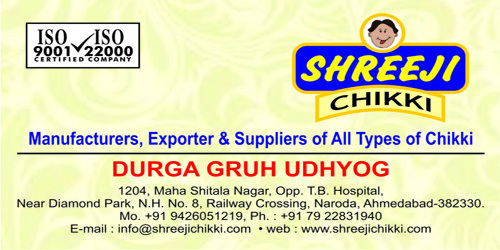 An ISO 9001-22000 Company ‘Shreeji Chikki’ was established in the year 1981. We are the major manufactures & exporters of various kind of Quality chikkis since the last 32 years. 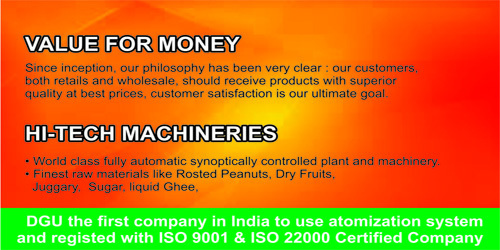 We are truly a customer centered company, organised enough to look after our customers’ needs to provide the best quality of Chikki & packed under hygienic conditions.Our product has national value of a healthy snack which can be consumed anytime, anywhere. We regularly export our item from India under the name of Durga Gruh Udhyog and are expanding our successful business to Africa,Europe & Latin America. We firmly believe in forming a symbiotic and everlasting business association with you. Serving you the best of our Quality & Services in order to win your trust for a long term business relationship. It would be our pleasure to deal with your esteemed company.